NOTICE! We are working on the 2019 information What we Know is it will be held June 22nd and 23rd! Welcome to the Idaho Rally international Web page. You will see pro level drivers like Travis Pastrana, Ken Block, Ryan Millen, and Jeff Seehorn as well as many others. And for those following the local guys keep reading below. As always Idaho Rally Group strives to make the volunteer experience a great one. As a volunteer you get the Swag, the daily meals and amazing access on the roads that no spectator could hope for. Make it a camping trip and you are set. This year with the addition of extremely high level competition you are sure to remember this experience. It will be the story you tell your grandchildren. Sponsors are one of the most supportive and engaged parts of Any organization. The sponsors are part of the reason why we push ever harder to expand our event to offer more bang for the buck. We believe 2018 is the next level for the sponsors. The draw from big names and big sanctioning and wider media coverage means more customers and recognition for our sponsors. Download the sponsor packet here. Yes the competitors. What do they get? Lets start with the big names. They finally get pointed access to what is arguably the largest rally event in the United States. They get to drive what has been called the best roads in the world for Rally Racing. 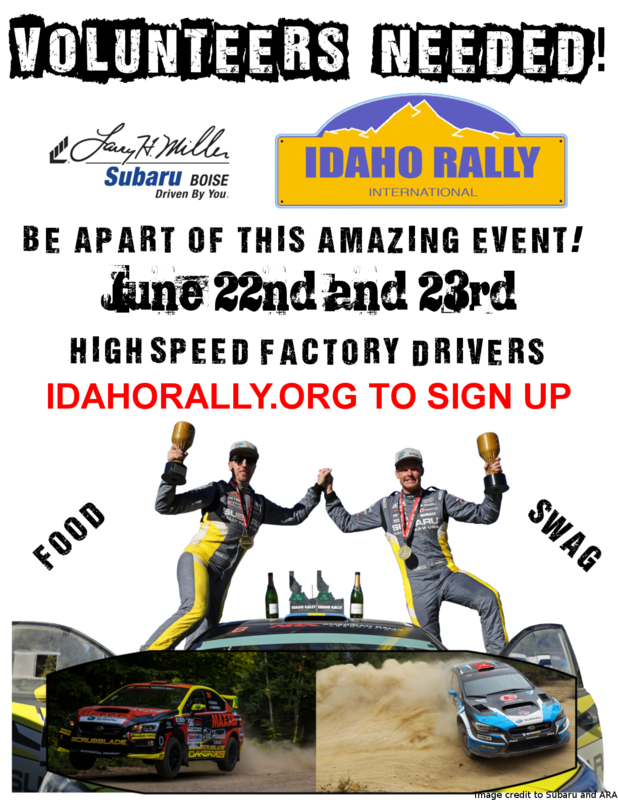 We know they will talk about Idaho Rally International when they talk about the best venues around the world. Now lets talk about the regional guys. They really make out on this deal. Idaho Rally Group has kept our regional sanctioning so that those in the CRS, CIRC and those that just want to race, can come and see where they rank with the big guns. But at a regional entry price. You heard that correctly. THERE WILL BE NO PRICE INCREASE FROM 2017 FOR THE REGIONAL ENTRIES!!!!!!!!!!!! OK there is a third group of competitors that will be excited to hear this. The UTV or SXS competitors. Idaho Rally was one of the first if not the first Rally in the United States to include the UTV/SXS racing. It was so successful that other Rally sanctioning bodies added classing for these vehicles. 2018 will include SXS/UTV racing! Do you think your turbo SXS has what it takes to compete with the cars? We have seen them perform right up with the top three at our events. National sanctioning. New date. Regional pricing. Top name competition. Bigger, Better, Faster, And more Awesome then ever before! Click here for Live Event Results! For those Driving Subaru vehicles there are some discounts in the 2018 Idaho Rally. The first 10 Subaru driving entries in each category can take advantage of the following discounts using these codes when you register. Note:: only the rally car price includes notes. Be sure to read the sups for details on Travel credits! Be sure to let them know you are with the Idaho Rally International. Other wise they will tell you they are BOOKED! All information subject to change. The final sups will be the final word. Download your posters and flyers here!